... more added as we go-go-go! "Words, words, words. 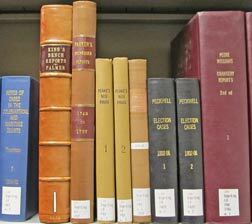 Every year adds to the (law) reports about 250 volumes and about sixty volumes of text-books. If something violent should happen to all the law reports now crowding our shelves, and all, or nearly all of the books of alleged authors on particular branches of the law - such books being in the main a product of scissors, paste-pot and a $10-a-week drudge - would anybody suffer?" So pondered John A. Finch to the Indiana State Bar Association circa 1900, a bit odd as he was the author of the Insurance Digests! "Learned men, who have employed their time in transmitting to posterity, with accuracy, precision and true judgment, a history of cases of weight and difficulty, falling within their own experiences, have been real benefactors to the public; and their memory is and ever will be treated with due esteem." For every law report and every collection of statutes or of law journals, there is a legal citations: those little itty bitty funny abbreviations that seem to infect every page of a judgment or legal article; esoteric combinations of letters, weird capitalization and funky punctuation. With thousands of law reports and law journals out there, you need to know what the references are and what you're reading. That's where we come in, expanding those little citations into their full blown and proper title each and every time you need to know. Legal citations are like postal codes ... zip codes ... bar codes: with a minimum of information the citation is extended to the reader allowing him/her to hone in on the law source, be it a statute, a published case or a law journal article. There are as many legal citations in the world as there are stars in the sky on a cloudless night. Sometimes, even the most remote of law reports has multiple citations. Consider the Canadian Supreme Court Law Review. When it first came out, in 1980, it officially demanded to be known as Supreme Court L.R. But the academic legal citators balked and preferred Sup. Ct L.R. Circa 2001, the Supreme Court changed their preferred citation to S.C.L.R.!! Who is right; which is more authoritative? None ... and all, so we have to create three separate pages for each citation as you may come across any of the three, all referring to exactly the same law journal: Supreme Court L.R., Sup. Ct. L.R. and S.C.L.R.! Now you know why lawyers make so much money?! But that won't stop us nor should it with the capabilities, speed and database depth the Internet provides. "Letters are habitually used as an abbreviation for words. For instance, the letters "U. S." are universally understood to stand for the United States. The letters "Ky." for Kentucky." But, IAS (in all seriousness), we do welcome suggestions, etc. (see Contact page). 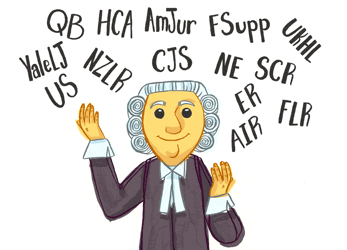 See, also, our Guide to Legal Citations. ... and many others all of which we would like to introduce on my Duhaime's Legal Citations and Abbreviations ACKNOWLEDGEMENTS page.